Some of my favorite books are by Jane Austen, so when I was offered the chance to interview the author of a new non fiction by Jane Austen, The List Lover's Guide To Jane Austen I jumped at the chance. Please help me welcome author Joan Strasbuagh to A Buckeye Girl Reads! My review will be up next week. This is such a unique non fiction book! Her life, her work, her legacy--step into the world of the incredible Jane Austen. It's Jane like you've never seen! Through fun and breezy lists, discover everything there is to know about Jane Austen, the sassy literary genius we know and love. Learn her likes and dislikes, her haves and have-nots, where she traveled, how she lived, and who she knew. With a wealth of little-known and fascinating information, find out: -Her friends and her beaux -Every place she lived or visited -Books in her library -Her quirks -The last lines of everything she wrote -and much more! "An amusing and informative compendium of all things Austen." --Emily Auerbach, Professor of English, University of Wisconsin-Madison, author of Searching for Jane Austen "Engaging, entertaining, and well researched, this book should be on every Austen lover's wish list." 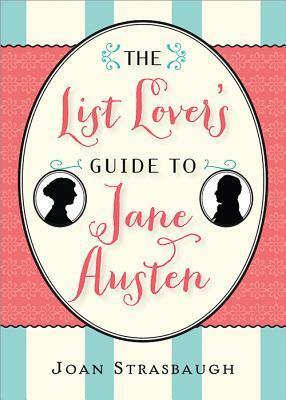 --Carrie Bebris, author of the Mr. & Mrs. Darcy Mystery series "It will teach you new things about Jane Austen's life--we tend to think of her life as a very quiet and confined one, but just look at the list of people she knew and mentions in her letters." --Susannah Fullerton, President of the Jane Austen Society of Australia and author of A Dance with Jane Austen and Happily Ever After After. A couple of years ago I gave a talk at the JASNA AGM (Jane Austen Society of North America Annual General Meeting, that's a long one!) on Sense and Sensibility and spent quite a lot of time researching my topic, which was loads of fun to do, there are so many great books about JA out there. However, at times I wish I had a handy little guide, so now, here it is. 2. What was the first Jane Austen book you read? Pride and Prejudice, right after I saw the BBC version with Colin Firth. 3. How much research went into the book? Lots! But that was the best part, there's nothing more entertaining than looking up info on Jane Austen and rereading her books. 4. What's the craziest thing you discovered while researching? Craziest? Don't know if this is crazy, but she has a surprisingly morbid sense of humor. "Sir Tho: Miller is dead. I treat you with a dead Baronet almost every Letter." 5. What made you become an Austenite? See answer 2. Once I read one of her novels, I had to read them all. Then I had to read everything she wrote, then I started reading about her, &c, &c, as Jane would say. Thank you Joan for coming on A Buckeye Girl Reads!! !